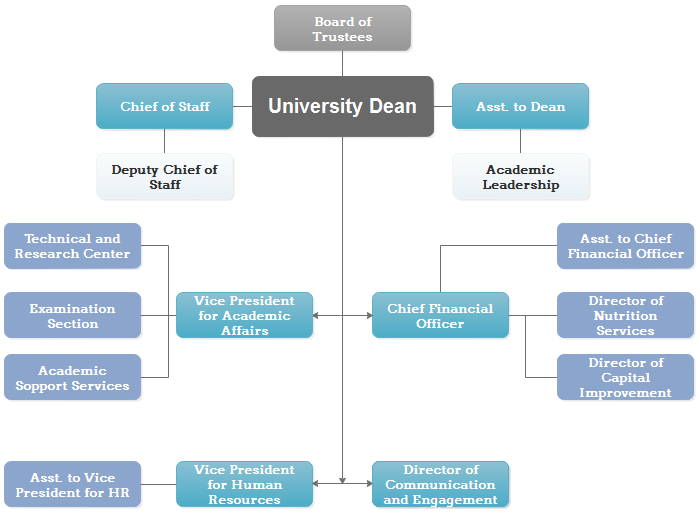 The administrative structure of university, a visual system of the management of the staff, is created to capture the positions or titles to direct the work. An administrative structure of university is often used to illustrate the positions, responsibilities and hierarchical system of an educational group. Presidential or Executive-level: includes positions such as financial officer and director of human resources. Provided with all information about an administrative structure of the university, it should be easy to create a logical university administrative structure with the help of org chart maker. Below is an example of university org chart. Due to different policies in different countries, the administrative structure of university differs. This example is a basic illustration about how to design an university administration org chart. You can click to view more administrative structure examples. Free Download this Professional Org Chart Maker and Start to Create Your Own!